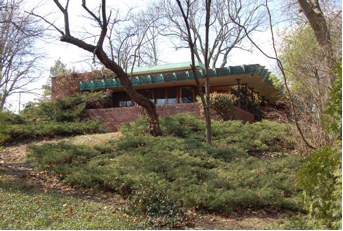 ESSAY: Frank Lloyd Wright's Usonian Homes: Attainable Dream or Economic Fantasy? Frank Lloyd Wright’s Isadore and Lucille Zimmerman House, completed in 1952, is located on an unobtrusive Manchester, New Hampshire street. Its deep, rust-red brick form contrasts with the more traditional New England homes on its street as well as with the vivid green foliage or white snow of the land around it. This house was designed in the Usonian idiom in 1949. From the bricks that make up the house to its interior decoration, it was designed to be a compact and affordable yet comfortable space for the childless couple. It is a fiercely one-story home, an ode to horizontal lines, with no attic or basement. Facing the street, the house is designed as well for privacy; the low-hanging roof and small casement windows serve to draw the focus of the house and its inhabitants inward. Figure 1: Zimmerman House, exterior. 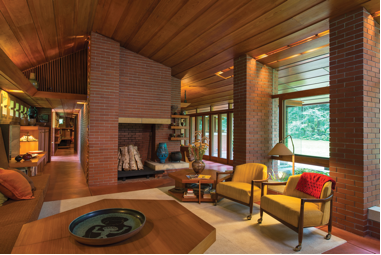 The interior of the house is a classic example of the Usonian ideal. The house opens onto a narrow hallway leading to a living room anchored by a fireplace. The living room, called the “Garden Room” , the largest room in the house, is wood-paneled and full of light. Built-in seats line one wall, and in a specially designed nook sits a grand piano (the Zimmermans were extremely fond of music). Accenting the room are various artworks, including African-inspired sculpture and Japanese prints. One wall of the living room facing the spacious backyard is largely made up of windows. Plants hang along the inside of these windows, connecting the greenery outside with the interior. Just off the Garden Room is a small eating nook, a walkthrough kitchen, and the size-conscious master bedroom and guest bedroom with accompanying bathrooms. 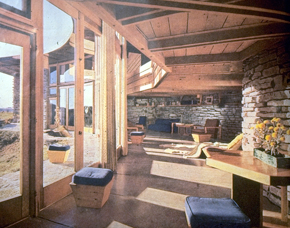 Figure 2: Zimmerman House, interior. View of Garden Room. The Zimmerman House is situated on one acre of land and is a grand total of about seventeen hundred square feet, 600 of which are allotted to the Garden Room. There is no extra space in this house; it is clearly designed for a single family without children. While a house roughly this size during this time period would normally cost around $5,000-6,000 dollars, the Zimmerman House ended up totaling over $50,000 dollars. Yet the Usonian Home, in theory and in reputation, was ostensibly meant to be an affordable single-family home. Given the context not only of this house, but of Wright’s habits with money, materials, and his inability to keep costs down, I will be discussing whether Usonian Home was truly meant to be an affordable middle-class home, or was instead geared more toward and upper-middle class demographic. Why did Wright’s Usonian projects go over budget? Did Frank Lloyd Wright truly have the best interests of middle-class America at heart, and did he understand how to fulfill their desires? Based on the reasons outlined above, I argue that contrary to popular opinion, the Usonian Home was not a particularly affordable dream for the middle class. To this end, I will examine Wright’s history of residential home building as well as his monetary and material habits and shortcomings. What Was the Usonian Home? The Usonian Home was part of Wright’s vision for a new America of which he would be the principal architect. The term “Usonia” derives from writer Joseph Duff Law and represents a new name for the United States, which he detailed in his 1903 Here and There in Two Hemispheres: “United States of Northern Independent America” . 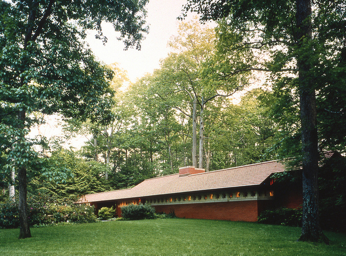 For Wright, the Usonian House referred to his new way of exploring organic architecture (architecture that was imbued with an awareness of and was characterized by a synthesis with its natural landscape), combining it with the mass-production capabilities of the machine he so admired, thus creating a new architecture for a new America. In theory, “the underlying aim of the Usonian home was to provide an in-expensive residence that would encourage an informal style of domestic life. Structurally this suggested large, open living areas and small bedrooms with built-in storage space, all arranged on a horizontal floor plan […] Construction methods eliminated decoration […] and introduced such innovations as board and batten walls and gravity or radiant floor heating” . Figure 3: Floor Plan of the Zimmerman House, 1949-1952. Usonian Homes, as a rule, have no attics or basements. The garages of larger homes are here expressed in a much more cheaply produced carport. The dining areas are consolidated into nooks connected to the living room, while the kitchens are small walk-through affairs graced with clerestory windows that provide light. The living rooms are often centered on a hearth or fireplace, a common pattern in Wright’s architecture. While the front-facing windows are small and deep-set to provide privacy, the back-facing windows are often full-length to let in as much of the outside environment as possible. The first Usonian Home is thought to be the Herbert Jacobs House, built in Madison, Wisconsin in 1936. Several of the later models would also make use of prefabricated concrete blocks. Yet despite such allegedly cost-saving measures, why did several of the more prominent Usonian homes fail to be affordable middle-class residences? Wright’s own history with handling money in both the professional and personal realm can point to some answers as to this discrepancy. Essentially, running theme throughout Wright’s life and career is his mishandling and misunderstanding of funds. According to Wright historian William Storrer, “Wright never knew how to estimate costs or he underestimated them… He always was overspending” . Over the course of his life, Wright was consistently and constantly in debt, having to mortgage his sanctuary of Taliesin in Spring Green, Wisconsin, several times. When he began the Taliesin Fellowship, it was largely a way of raising money (to look at its inception cynically). Apprentices were charged tuition to keep the home and farm at Taliesin running and were given neither a promise of a career nor an accredited architecture degree. Some of the first students included Wes Peters from MIT, and Edgar Tafel, an architecture student from New York University. These students left prominent, accredited institutions for Taliesin, whose tuition cost “$200 a year more than at NYU” . Later on during the Fellowship years, apprentices were required to pay full tuition for both themselves and for their wives, despite the fact that the wives were not enrolled in the school or taking classes. On a more personal level, while Wright is today best known for his contributions to residential architecture and residential living, throughout his life he longed for big commissions with prestige and, one assumes, deep-pocketed funders. Additionally, Wright had a long history of misunderstanding what was affordable for the middle class. Architecture aside, throughout his career, the fastidious Wright insisted that his clients not only bend their way of living to his home designs, but also hire him to design all of the furnishings that would go in the house, from tables and desks to the napkins his clients wiped their mouths with. This tendency likely added yet another unforeseen expense in the commissioning and purchase of a Wright Home. In the Ladies Home Journal in 1907, Wright described his plan and design for what he considered an affordable middle-class residence in “A Fireproof House for $5000”. In Wright’s article, he described the measures he would undertake to keep costs down; for example, he planned to eliminate “[the] attic, [the] ‘butler’s pantry’…no back stairway [has] been planned; [these] would be unnecessarily cumbersome in this scheme, which is trimmed to the last ounce of the superfluous” . Figure 4: Image from "A Fireproof House for $5000". At the time, however, the average salary was between $700-800 dollars per year—making this so-called affordable home less a reality for the middle class. For comparison, this would be akin to someone with a 2013 income of around $16,000 dollars spending $117,000 on a house. This issue could have been further compounded due to the state of loans and mortgages at the time. Wright made his name around the turn of the 20th century designing Prairie Homes for wealthy clients, both in Oak Park and in other Chicago suburbs. 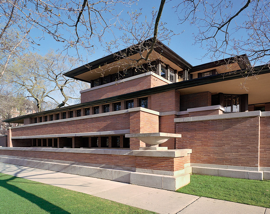 His most famous such home, the Robie House (1907-10) cost a total of $58,000, or $1,300,000 in 2007 dollars. The house, typical of the Prairie School, has an overhanging roof, deep-set casement windows allowing for privacy, and a central fireplace and hearth. Figure 5: Robie House, exterior. One early example of Wright’s inability to stay on budget is the story of the Harvey Sutton House in McCook, Nebraska (1905-08). During the project, the Suttons butted heads with Wright not only over the cost of the house, but over the plans and building schedule as well. Figure 6: Sutton House, exterior. In 1906, “Mrs. Sutton wrote to Wright, informing him that no payment would be made until she and her husband were satisfied: ‘Am figuring right along and doing all in my power to get started this spring as husband says we must have a house built by fall. Have fooled long enough. Have an unsightly hole at our front door and he is disgusted with it and I am discouraged’ ” . Wright wrote in response: “Meanwhile, I will have to ask you to consider the architect a little as he certainly has taken pains enough to please his clients on this work and is clearly entitled to compensation for his services whether the building is built or not. He really needs the money badly at the present time and a check for $300, which should have been paid him long ago, should be paid without further delay” . While the Suttons requested a house with a budget of $2,000 dollars, a fairly middle-class price, the final project ended up costing more than $10,000 dollars. The Suttons were incensed. Wright’s most famous residential design, Fallingwater, was designed for the wealthy Kaufmann family in 1935 and constructed over the following few years. While the starting budget was generous, the final house ended up costing over $155,000-$120,000 over budget. In 2013 dollars, Fallingwater would cost over 2.5 million dollars. John and Catherine Christian commissioned Wright to build them a Usonian Home, “Samara”, in 1950 in West Lafayette, Indiana, on a budget of $22,000. “In 1954, Wright turned in his first set of drawings. There was no basement or formal living room for which the Christians had asked, and he estimated the design and construction budget for the 2,200-square-foot house at no more than $35,000. The Christians agreed to the cost, but advised Wright that the interior furnishings, also designed by him, would have to be bought as their income allowed. On Jan. 1, 1955, the Christians received Wright's final drawings. Two days later, Wright received a letter from John questioning the need for such a large living room. Wright replied via telegram. ‘Sorry you feel living room too large never yet have seen one too large if anything yours is too small’ ”. Figure 9: Kentuck Knob, exterior. In the 1950s, I.N. and Bernadine Hagan commissioned Wright to build them a house, interestingly, near Fallingwater in Pennsylvania. The house, “Kentuck Knob”, is a larger Usonian model with 2,300 square feet of space. Like its earlier, larger neighbor, Kentuck Knob predictably went over budget. The Hagans anticipated spending $60,000 on their custom-built, one-story home. The final price tag came out to nearly $100,000. A large part of why Wright was unable to keep costs down for his residential designs lies largely within Wright’s ideal-based methods of architecture and the repeated failures to translate those ideas into workable architecture. This issue is a recurring theme throughout his oeuvre. Whether the issues derived from poor design or poor construction, as far as living in them goes, Frank Lloyd Wright homes are today considered to be “significant headaches” . For example, Bear Run’s Fallingwater was beset with plenty of flaws. Due to its perilous, dazzling location over the waterfall itself, “it had problems with mold. 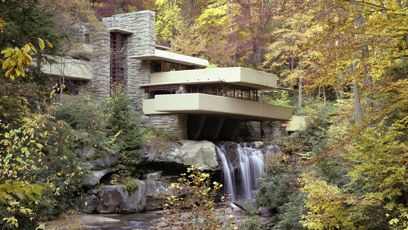 The senior Mr. Kaufmann called Fallingwater ‘a seven-bucket building’ for its leaks, and nicknamed it ‘Rising Mildew’ ”. According to architect Robert Silman of Robert Silman Associates, P.C., in New York, Fallingwater was designed quickly and likely suffered from many construction-related mistakes. Fallingwater would eventually require an arduous 5-year, 11.5 million dollar restoration. 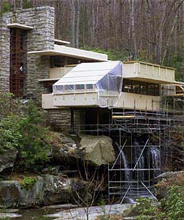 Figure 10: Fallingwater undergoing restoration. A May, 2013 article in the Wall Street Journal further details the “promise and pitfalls” of living in a Frank Lloyd Wright-designed home. For example, the 1923 Alice Millard House in Pasadena, CA, colloquially known as “La Miniatura”, is “prone to leakage during heavy rainfall, partly due to the experimental construction, said Crosby Doe, its real-estate agent” . As a result, despite a multi-million-dollar restoration and repeated markdowns, this textile-block house is having a hard time finding a new owner. Another local textile-block house, the 1924 Freeman House in the Hollywood Hills, suffers from a disconnect between design and construction and from vulnerability to earthquakes (natural to the region), and thus has been under renovation for years with no end in sight. Figure 11: Freeman House, interior, undergoing restoration. Wright’s Usonian homes are not spared. Several suffer from design or construction issues that at the time of their commissioning created problems for the clients and today bear these marks. The 1946-8 Jacobs II House, in Madison, Wisconsin, originally was furnished with single-paned windows in an effort by Wright to cut on costs. However, once the family moved in, replacement of the inadequate windows in light of the harsh Wisconsin winters became a necessity. In a house with many windows, it was an added expense. The Zimmerman House also suffered from shoddily executed elements. The Garden Room’s hearty red floors, meant to be concrete mixed with the pigment, was originally installed as concrete floors with the color merely appliqued. It soon flaked off and the floors subsequently needed replacing. Figure 12: Jacobs II House, interior. On a larger, more disastrous scale, the Bachman Wilson House from 1954-6 in Millstone, New Jersey, is located such that its current owners have faced damage from seven floods and are trying to sell the home before another hits. “But they have laid down unusual conditions for the buyer: Dismantle, move and reconstruct the 2,000-square-foot house on a suitable natural site” . That Wright continually had these design hiccups yet refused to admit that his too-good-to-be-true homes should have in fact cost more for a sound design indicates that Wright was more concerned with his image and with making money than with actually designing an affordable, economical middle-class home. Given the largesse of Wright’s inability to stay on budget, it seems a miracle that any of his homes could be completed within the set budgetary parameters. The question remains thus: was the Usonian Home truly middle-class friendly? According to Wright, “the house of moderate cost is not only America's major architectural problem but the problem most difficult for her major architects. As for me, I would rather solve it with satisfaction to myself and Usonia, than building anything I can think of at the moment” . Wright ostensibly designed every aspect of the house to cut both manufacturing and building costs, yet as with many other of his projects, the final price tag ended up being far greater than the owners envisioned, and certainly out of the price range of the American middle class. 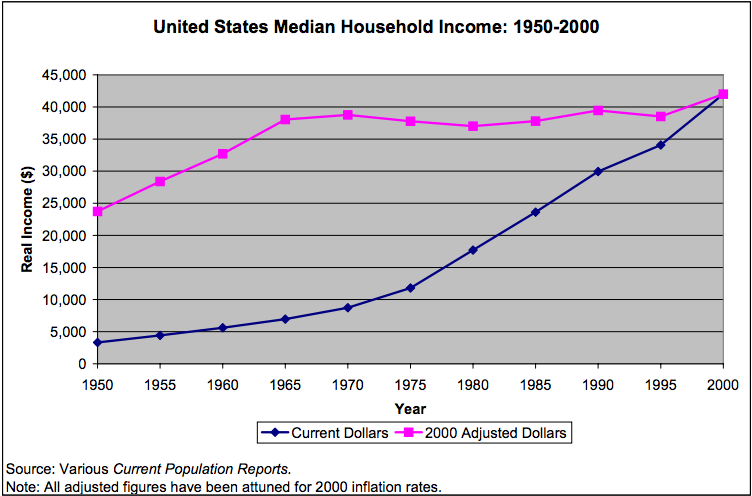 For example, median income in 1955 was about $5,000 dollars per year, or about $28,000 dollars in 2000, and about $48,000 dollars in 2013. Spending about $50,000 dollars on a house in 1955 on an income of $5,000 would equal spending almost $450,000 on an income of $28,000—hardly middle-class friendly, and likely not what Wright’s Usonian Home clients were anticipating. While the Usonian Home has gone down in history as Wright’s contribution to affordable 20th century middle-class housing, Wright’s own personal history with money as well as the costs many of the homes themselves question this prevailing view. Wright derived most of his residential building experience working for upper-middle-class and wealthy clientele in Oak Park at the end of the 19th and early 20th century; not only did those houses not cost what a middle-class home would, but the so-called “Fireproof House for $5000” was also above what the average middle-class family could afford to spend on a home. Wright also lacked scruples or shame in his personal monetary affairs, charging apprentices for what amounted to indentured servitude or refusing to serve clients what he owed without advances on compensation. Throughout his life he mishandled funds and purposefully, at times, lived beyond his means. His habits with money translated into his architecture; many of his large projects, both residential and public, went over budget and even then, required significant restoration and renovation to be made useful. When Wright turned to creating Usonian Homes, these habits did not cease, but instead persisted on a smaller, if broader scale. Throughout the processes of design and construction of these houses, the designs trumped feasibility and reason; even the Usonian homes of lower-cost were hardly a bargain, with their thin windows and cheap materials intended to save money needing replacing at the owner’s expense. While it is important to note that many, many Usonian Homes were designed and built over the course of Wright’s life and the ones that did go over budget do not necessarily represent the dominant trend, I argue that this tendency, outlined in the examples above, is quite important to consider when taking into account the entirety of Wright’s life and his history with money. The way Usonian Homes and their construction relate to money is indicative of a larger misunderstanding on Wright’s part, whether willful or not, on the kinds of lives middle-class Americans could afford to lead. 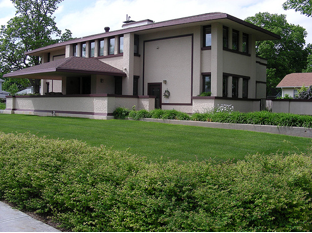 Allison Dickey, “The Currier Museum’s Zimmerman House: A Frank Lloyd Wright Masterpiece in New England,” Art Documentation: Journal of the Art Libraries Society of North America (2009): 49. James Duff Law, Here and There in Two Hemispheres (Scotland: Home Publishing Company, 1903), 112. Rick Beard, introduction to Realizations of Usonia: Frank Lloyd Wright in Westchester, catalogue produced by the Hudson River Museum of Westchester (Salina Press, 1985), 4. Wright, Frank L, and Bruce B. Pfeiffer. The Essential Frank Lloyd Wright: Critical Writings on Architecture. Princeton: Princeton University Press, 2008. Levine, Neil, and Frank L. Wright. The Architecture of Frank Lloyd Wright. Princeton, N.J: Princeton University Press, 1996. Friedland, Roger, and Zellman, Harold. The Fellowship: The Untold Story of Frank Lloyd Wright & the Taliesin Fellowship. New York: HarperCollins, 2006. Law, James Duff, Here and There in Two Hemispheres. Scotland: Home Publishing Company, 1903. Beard, Rick, introduction to Realizations of Usonia: Frank Lloyd Wright in Westchester, catalogue produced by the Hudson River Museum of Westchester. Salina Press, 1985. Faverman, Mark. “Frank Lloyd Wright's Great Usonian Vision: The Zimmerman House in Manchester, NH.” Berkshire Fine Arts, May 10, 2008. Accessed November 20, 2013: http://www.berkshirefinearts.com/05-10-2008_frank-lloyd-wright-s-great-usonian-vision.htm). Chusid, Jeffrey. Saving Wright: The Freeman House and the Preservation of Meaning, Materials, and Modernity. W. W. Norton & Company (December 19, 2011), ch. 5. Figure 3. The Wright Library, http://www.steinerag.com/flw/Artifact%20Pages/PhRtS333.htm, from “The Frank Lloyd Wright Companion” Storrer, William Allin, 1993, page 353.